Oh, my BookNerds know how to throw me for a loop. My situation with this Book of the Month was similar, in a way, to the month we read My Beautiful Failure. I got this book from the library, read the description, and had zero interest in reading it at all. I set it down on my coffee table and neglected it for weeks. I picked it up several weeks later, added it to my TBR on Goodreads and read some reviews. I still had no desire to read it. I set it back down on my coffee table and started to think about ways to tell Jacque that I was opting out of this month's read. Then Jacque tweeted me to ask if I'd started it. I saw the tweet today, Sunday afternoon, while I was lazing on my couch reading another book. Instead of tweeting her back that I wasn't going to read it -- which was completely my plan -- I picked it up and started reading. And then I read the entire book in a matter of hours. Wow. First of all, the writing style is very easy. It just flows. It makes it a fast and easy read. Second, I was fascinated by the characters. In the author's note at the end of the book, Jennifer Brown explains how she never understood how abused women never left their abusers, and how often women are quick to say, "One time and I would leave!" They have never been in the situation, yet they are so sure they wouldn't stand for it. But...they've never been in the situation. "..we don't often often enter romantic relationships based on what's going on in our minds," she says, "We love, and because we love, 'I would never...' becomes an incredibly inaccurate prediction." In several of the reviews I read, people did not like Alex. But I guess what struck me about her is that she was very rational. The arguments that she had in her head made sense. And throughout the relationship she wasn't often speaking from a deluded point of view. She knew she was being abused. She saw that the relationship was hurting her physically as well as hurting all her relationships. But... The but. I read this book in a matter of hours because I wanted to see how she would come out of it. (I never assumed that Jennifer Brown would end the book with her protagonist still in the relationship, as recovery is part of the journey.) And in the end it was a little reaching out -- very realistic to Alex and what she could do at that point. Not a big lightbulb, per se, but one small, scared hand reaching out. Book Nerd Teri and I attended one of the author speed dating sessions at this year's RT Convention and met Jennifer Brown. I never would have selected one of her books based upon the descriptions, but by the end of our short discussion with her...Teri and I were sold. 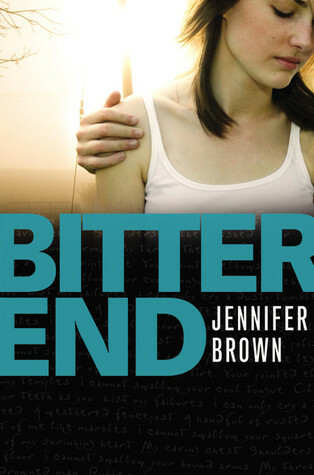 Her books deal with very difficult subjects that are relevant to teens/high school students. Bitter End is about an abusive relationship. Alex is a senior in high school and has been best friends with Bethany and Zack since they were all in diapers. She is an excellent writer and spends time tutoring other students. This is how she meets Cole, a standout athlete who transferred from another school for his senior year. They begin dating and everything appears to be wonderful, but Zack does not approve of Cole. Something happened between them in gym class, but neither Cole nor Zack is willing to discuss it. Cole becomes obsessive, stalkerish, controlling, and eventually his jealousy/anger turns to violence. Bitter End is a very fast read and I was immediately drawn into the lives of the characters. I could completely understand and appreciate Alex's thought processes. I'm sure everyone has heard of situations like this and unless you are the one in the situation, you can't fully understand what is going on. We all think...WOW...this guy is a creep and if it were me, I would ________. It is very easy to judge someone else, but there is always more to the story than meets the eye. Alex is not weak. She knows from the very first incident when something is amiss, but she can always seem to rationalize it. This is an excellent book that I would highly recommend high school students read. It is a great way for teens to break the ice and begin thinking and perhaps discussing these types of situations with their friends or *gasp* maybe even their parents. Even if the topic doesn't pertain to them or someone they know, becoming more aware of domestic violence and ways to recognize and deal with it before it spirals out of control could certainly benefit anyone. So glad to hear you enjoyed this one! This sounds really good, looking forward to checking it out! It is definitely worth reading. I hope you enjoy it as much as we did.